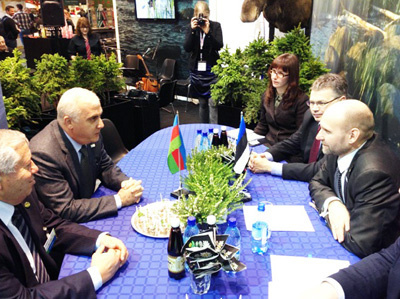 Signing agreements on cooperation in the field of veterinary, phytosanitary and technical and scientific cooperation is expected between Azerbaijan and Estonia in April 2013, Trend news agency reported. This proposal was made by Estonian Agriculture Minister Helir-Valdor Seeder at a meeting with Azerbaijani Agriculture Minister Ismet Abbasov. According to a report of the Azerbaijani Agriculture Ministry, published on Tuesday, the meeting was held within the framework of the 78th International Exhibition-Fair 'Green Week 2013'. Abbasov reminded his counterpart that following discussions held in Baku in April 2012 as a part of the FAO Regional Conference for Europe to strengthen cooperation in the agricultural field, agreements were prepared and submitted to the Estonian side. In this regard, the Estonian minister invited Abbasov to take part in an agricultural exhibition in the city of Tartu in April 2013, offering to sign these documents in the framework of the exhibition. Furthermore, Abbasov and Latvian Agriculture Minister Laimdota Strauyuma discussed areas of cooperation reflected in the memorandum of understanding signed between the agriculture ministries of the two countries in Baku in June last year, and effective steps for their implementation and cooperation mechanisms. As was noted at the meeting, despite the fact that today the trade turnover of agricultural products of animal and plant origin between the countries is at a satisfactory level, it does not meet the existing potential. Due to an increase in turnover, the sides noted the need to sign an agreement on cooperation in the field of veterinary and phytosanitary. Strauyuma also invited his Azerbaijani counterpart to participate in an agricultural exhibition to be held in Riga in April. As part of his visit to Berlin, Azerbaijani Minister of Agriculture signed an agreement on cooperation with his Lithuanian counterpart Vigilius Jukna.